Sally's daughter Emma is an up and coming harpist and is experienced in playing at all kinds of events. She studied the harp from a young age with the well respected harpist Ann Hughes-Chamberlain. In 2003 she was awarded a music scholarship for harp and piano to Lancing College. While at University in London between 2005 and 2008, she played the harp for the University College London Orchestra (UCLO). 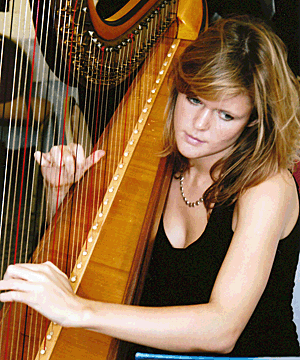 As a solo harpist, she undertakes regular bookings for weddings, dinners and parties - venues include Amberley Castle, Herstmonceux Castle, Stansted House, Goodwood Park Hotel, HMS Warrior, HMS Sultan, Lancing College, Wiston House, St Mary’s Bramber, Bailiffscourt Hotel, The Spinnaker Tower, Arundel Town Hall, Angmering Manor and Brighton Metropole Hotel.